These skyscrapers in China are showing off their unique, albeit strange facades far from the monolithic norms. China is zooming past the rest of the world for the most number of skyscrapers. In 2017 alone, 144 new buildings over 600 feet tall rose above the skyline of Asia’s economic giant. While monoliths are nothing new, these megastructures are turning heads for their strange and wondrous appearances. In case you’re wondering how a gigantic time machine would look like, make your way to Fushun City and catch a glimpse of the Ring of Life. Part of a lofty plan that fizzled out, this 515-foot high landmark has turned into a lone attraction. Nonetheless, the ring’s 12,000 LED lights dramatically emanate at night for photographers and sightseers. It’s almost an extraterrestrial landing site turning into reality. The gigantic steel loop known as the Ring of Life stands 515 feet from the ground. There’s a giant egg in the heart of Beijing that should be in your grocery list; we mean must-visit list. 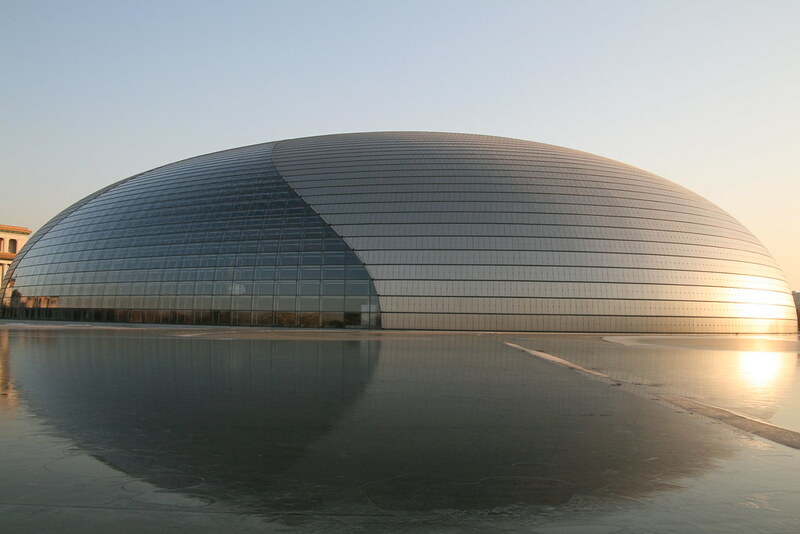 China’s National Centre for the Performing Arts is a stunning dome made of glass and titanium. French architect Paul Andreu designed the astounding complex that has three main performance areas: Opera Hall, Music Hall, and Theatre Hall. The halls can seat a total capacity of about 5,500 guests. At night, the center turns into a visual spectacle that glows over an artificial lake. In Beijing, the National Centre for the Performing Arts in Beijing is colloquially described as The Giant Egg, for all the obvious reasons. From various vantage points, The CMG Headquarters suggests a different visual impact as its architect Rem Koolhaas describes. China’s attempt to go toe-to-toe with the exuberant Palm Islands of UAE comes in the form of Phoenix Island. Tagged as Oriental Dubai, the island is home to five towers resembling the shape of fans. At first glance, the luxurious hotels look like spaceships landing on Earth. Phoenix Island is an artificial archipelago that offers a stunning view of the Sanya Bay. Aside from the hotel buildings, Phoenix Island has a theme park, shopping center, apartment buildings, sports and recreational areas. 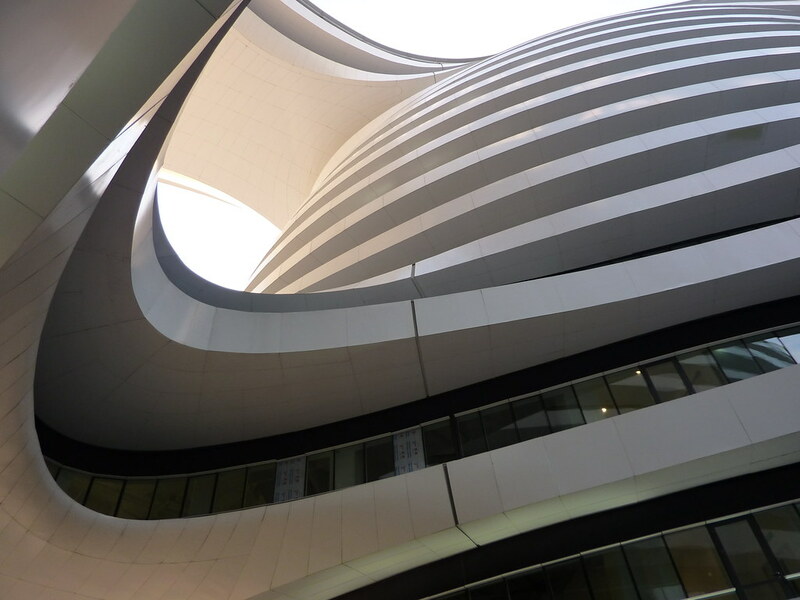 The stunning Galaxy Soho, Beijing’s biggest shopping mall, is a creation of Zaha Hadid and her team of architects. They took inspiration from China’s rice terraces with curves and levels seamlessly unending. The mall’s sky towers and bridges provide great vantage points for taking photos of the ultra-futuristic facade. While the Galaxy SOHO gives a sneak peek into futuristic architecture, it’s also widely panned. Critics call it an eyesore that ruined the architectural heritage of Beijing. The team that designed Galaxy Soho was led by the late Zaha Hadid, a renowned British Iraqi architect.